GSS Sudan makes it to the final! Electrifying and explosive! Any other words would fall short of describing the action on the field on Friday April 25, at the GNPOC Football Tournament 2014 Final Match. 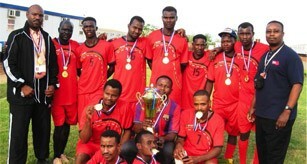 Last year’s champions, GNPOC, took on the GSS Sudan Football team and the tension and excitement filled the air hours before kick-off time. Speculations and predictions about the match results were on everyone’s lips. At the pre-match briefing, the GSS assistant coach Nazer Eldin Abdalla put forward the starting line-up, after considerable deliberations with the team manager Suraj Eldin Mubarak. In a show of solidarity, Suraj flew back from his vacation just to be with his boys in this hotly contested final game of the tournament. GSS Site Manager, William Mwendar, gave some pointers on where to improve compared to previous games. One of the supervisors, Fawzi Osman, also had a good word of encouragement for the team and supporters. Several important figures attended the match, including the guest of honour, the Commander of Sudan Armed Forces, and other military and police officers, as well as top GNPOC management from Khartoum and field base operations. About five minutes into the game, GSS striker, Elnoor Awadalla, hit the crossbar with a powerful shot that left the crowd on their feet. Twenty-five minutes later, GSS kicked the first goal in the net, followed by two others scored by other GSS strikers. GSS’ client, GNPOC, did their best to salvage whatever they could of the game, sending waves after waves of attack on the impregnable GSS defences. Yet, only minutes before the end of the game, Elnoor Awadalla gave GSS its fourth goal, resulting in early celebrations, up until the final whistle was blown. GSS won this year’s edition of the GNPOC Football Tournament, beating GNPOC four to one! “We will continue delivering quality where it’s needed most, be it at work or at play, and indeed in everything we do; the sky is our limit” Said Peter Zandvliet, GSS Sudan Country Manager. Congratulations team, keep it up!